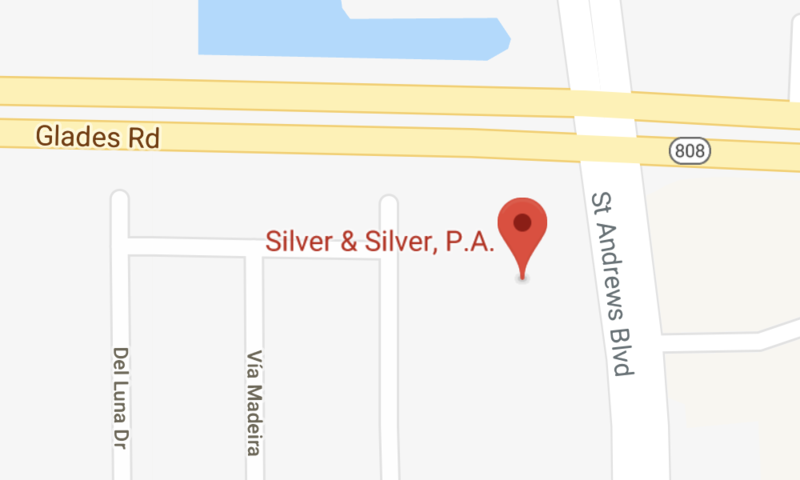 Boca Raton Car Accident Attorney - Silver & Silver P.A. Boca Raton Car Accident Attorney – Silver & Silver P.A. If you have suffered a serious injury in an auto accident that occurred due to the negligence of another person, you have the right to seek full and fair compensation for any other losses you may have suffered as a result. These include your medical care, loss of income, property damage and other considerations relevant to your case. The process involved with obtaining fair compensation can be extremely complex. Insurance companies want to settle your case for as little as possible. Many representatives will attempt to sell you a lowball settlement. They will claim that they have gone above and beyond to get the offer when, in many cases, the settlement barely covers your current losses and requires you to give up your right to seek any future care. At the law firm of Silver & Silver, P.A., we represent South Florida clients who are suffering because of another person’s negligence. From our principal office in Boca Raton, we handle cases in Boynton Beach, Wellington and the surrounding areas. A Boca Raton Car Accident Attorney at our firm understands the types of injuries that can happen in auto accidents, and we know what type of compensation is typically required to facilitate the victims’ recovery. While we always attempt to negotiate a fair settlement rather than put you through a long and painful court proceeding, our Boca Raton car accident lawyers will not recommend any settlement offer that they feel is not sufficient to accommodate all of your current and future needs. Our only concern is to obtain justice for every client we serve, and our opponents know that we are fully prepared to take your case to court if a fair settlement cannot be negotiated. Contact our firm today to discuss your car accident injuries with a lawyer. You can reach us by phone at our principal office in Boca Raton by calling 561-279-3911, toll-free at 800-513-8670 or via email to schedule a free initial consultation.